Politicians told loud and clear – cannabis is a health issue,not a criminal one. 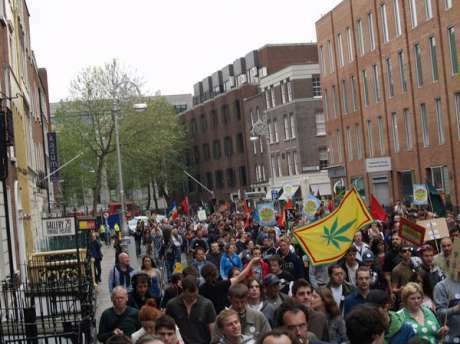 Over 1,500 people marched last Saturday demanding that cannabis be legalised in Ireland immediately and that the hypocrisy of cannabis prohibition end in all countries where it is still in place. On Saturday last, the second annual Legalise Cannabis march was held in Dublin city centre. The march was one of over 220 held worldwide in protest against the continuing prohibition of cannabis use in these countries.Hundreds of thousands turned out globally to highlight the hypocrisy, a legacy of twentieth centruy ignorance that has sadly persisted into the twenty first. The march buildup had been taking place for several months with flyers,informational pamphlets,badges,stickers,posters and tshirts produced to create some momentum for the march day but also to promote the campaign beyond the parameters of the march itself.Three awareness gigs were organised and well attended and the stage was set for the march itself. Hopes for a continuation of the glorious weather faded somewhat on Saturday morning when the drawing of the curtains revealed a gloomy,overcast day with puddles of water evidencing earlier showers.Minds wandered back to the inaugural march in 2007, which suffered in numbers due to the poor weather that day. However the rain just about held off and by 2.30pm the preparations were laid and final touches made as the crowds assembled at the Garden of Remembrance. 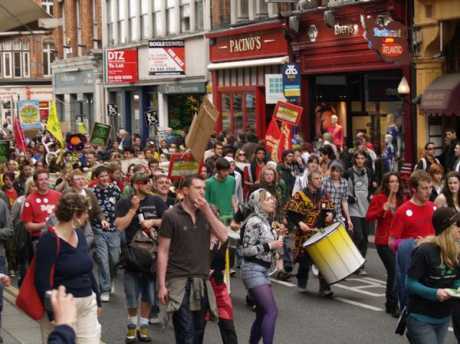 More seasoned marchers could not help but have noticed the livley,colourful and energetic nature of the crowd assembled,helped by the tribal rhytms of a samba band. The contrast with the drab banality of the Mayday parade the previous week could not have been starker. As the crowd increased so did the impatience and apparent nervousness of the attending Gadai. 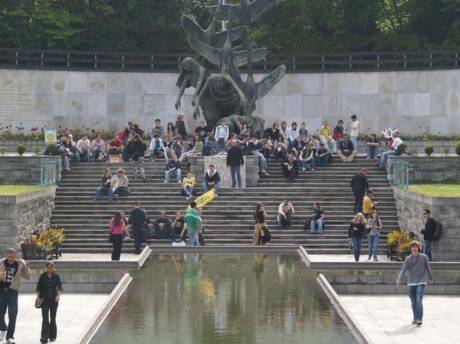 Having previously consulted fully with the Gardai regarding the details of the day,it appeared they had lost their earlier cordiality as threats were made to the organisers to get on with it “or else”. Ignoring this childish power play we completed the safe set-up of the musical instruments on the back of the truck and off we went to an exhuberant roar. 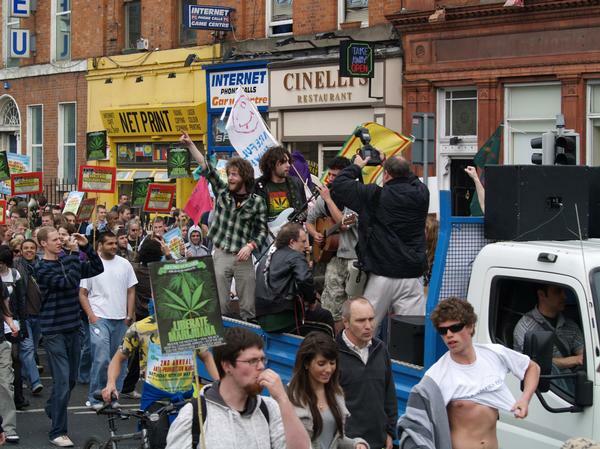 As the crown moved down the hill to the Ambassador Theatre and the top of O'Connell St chants of “Legalise It!” and “Free the Weed!” rippled through the crowd in chorus as well as the funky jam of the band “Fusion Family” and the exotic percussions of the samba troupe. As the march danced down O'Connell Street the numbers swelled as passers-by, joined in to show their support.By the time it wound its way around to College Green, the numbers were in excess of 1,500. Grafton St shoppers were bemused as the parade noisily passed. Some suspended their Saturday consuming in favour of satisying their curiosity as to what it was all about. Secondly that the fight for cannabis legalisation is a struggle for civil liberties. Thirdly that keeping cannabis illegal is the gateway to harder drugs,NOT cannabis itself. Fourthly that prohibiton puts the supply of cannabis into unscrupulous hands, leading to low quality,dangerously contaminated product,overpricing and cannabis being a facet of gangland activity. 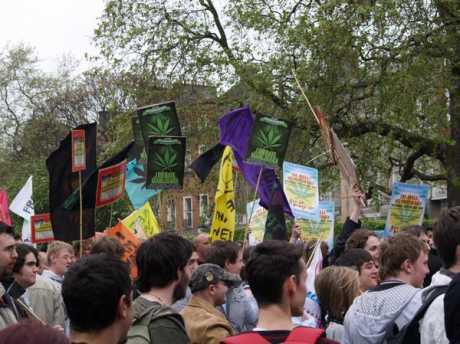 One speaker pointed out that if you can buy alcohol and tobacco in a safe,regulated environment,then why not cannabis,particularly given the fact that the aforementioned legal drugs have been conclusively proven by innumerable studies to be more harmful to health than cannabis. Following a few more ballads the march proper dissipated into smaller groups,one such group heading back towards the Garden of Remembrance along the not so traditional route!This group had as its core element the glorious samba band and by the time it was (re)entering College Green it was several hundred strong and full of life. By the time the author caught up with this autonomous remarch it was camped on O'Connell St next to the spire and was providing a vibrant and unique spectacle for the now-weary Henry St shoppers.The impromptu street party continued for approximately twenty minutes (with no interference from the watching Gardai) and then it made its final journey back to the Garden of Remembrance where people relaxed and enjoyed the first sun of the day with a well deserved spliff. A suitable end to a really fabulous day. Thanks must be expressed to all who came out on the day,the wonderful samba band and the clouds for holdin in their rain! Long live the onward march of a new Irish civilization! The best thing I ever saw from this campaign internationally was a crew in Christchurch (NZ) who would stage a presence outside the magistrates court every Monday stating their demands and offering advice and politicisation to those busted over the weekend turning up to their first court appearance. That's where you might meet other than the middle classes and provide a valuable community service. Great day, fantastic party atmosphere - full credit to the organisers and the drummers rocked. But what's with the paranoid electro soundtrack on the video - the samba is cool but the rest seems out of place. Throw on some home grown reggae, Lariman or Erik Noon would be just the job... my opinion anyway. No way was there 1500 people protesting, more like close to 300 at best. Yeh, I say from looking at the pics that 1500 is an exaggerated estimate. Looks more like 500. However many, they enjoyed themselves, some seemed to puff the magic dragon while marching with the samba band. 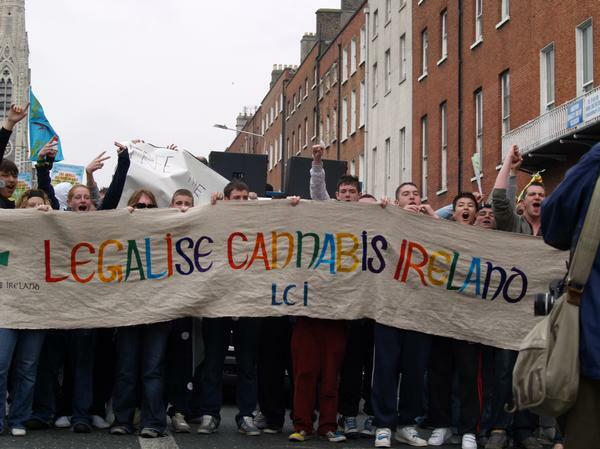 I wonder about the relevance of the Legalise Pot campaign to radical social aims in Ireland and elsewhere. Who'll benefit if it's eventually legalised - the working class, the pharmaceutical profession (that might get the govt franchise for selling the weed) or the dropout hippies? If they started a Legalise Poteen Making movement would the same campaigners join in? 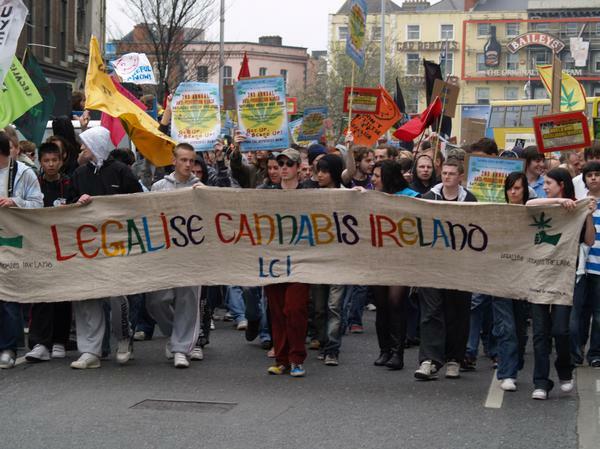 "If they started a Legalise Poteen Making movement would the same campaigners join in?" Jamesons ,Powers , Old Bushmill shareholders know that poteen i.e. the stuff made in the pot , is legal -all you need is a licence . I'd rather pot than poteen myself . There are two reasons why they won't decriminalize pot though that I can think of. 1People say that decriminalizion would take the criminals out of dealing which is true ,but then what would these criminals do .Would they go out and get jobs and start to live purposeful lives? No , they would move on to oher areas of criminality ,possibly crimes against property . Couldn't have that. 2 It suits the police to have some reason to arrest innocent people . 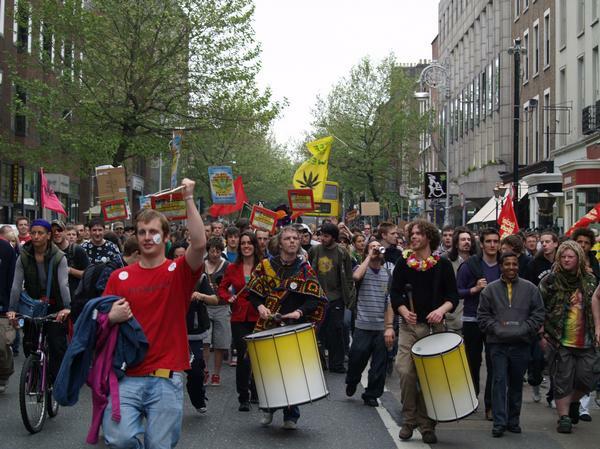 The state is tolerant towards pot smokers ,so long as they behave themselves in other ways. what the benifit of its legalisation?? where is the true benefit of it legalisation? 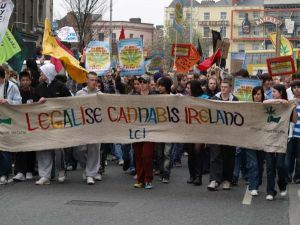 i dont think that the legaisation of drugs is what is necessary for the advancement of our country, i am as liberal as the next person but i dont think that legalising that which serious;ly messes with our minds is the true way for a socialist ideal, it would be exploited and we would suffer because of that. Live your life in fear but know that big brother loves you. 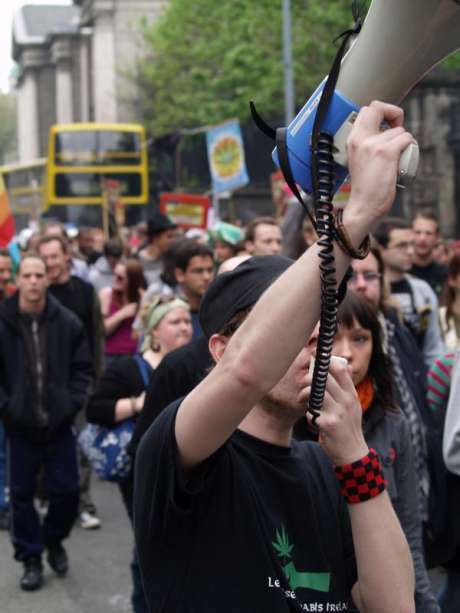 http://cannabisireland.net/ scroll down the front page and you'll see the benefits of legalization. BELARUS VID LINK (1 min) - Drug testing the players? - How about Breathalysing the Ref? Fair play , let 'em march and more power to them . Wasn't attending myself but that was personal choice and i suspect many many more feel the same way or had better to do. This sort of thing while heightening awareness to a degree is of little real effect . To change the laws more people need to stop using dealers and sort themselves out . I believe thats the way forward ironic as it may seem and you know what i'm saying. a march once a year will do feck all also i can't understand why labour youth is involved didn't they want a yes to the last treaty?? Leaving aside the mood altering effects of cannabis and its implications for learning motivation by students, I would like to say that I disagree with the smoking of cannabis. The weed is mixed with tobacco and then smoked like a cigarette. Thereby people are inhaling quantities of tobacco and running the health risk of carcinogenic fallout in the long term.